Investing in the best parakeet cage you can afford is the most important choice you can make as a bird owner (after choosing the bird itself that is!). This can be a confusing process, especially if you’re completely new to pet parakeets and so we’ll let you know what type of cage you need and the key features to look out for. 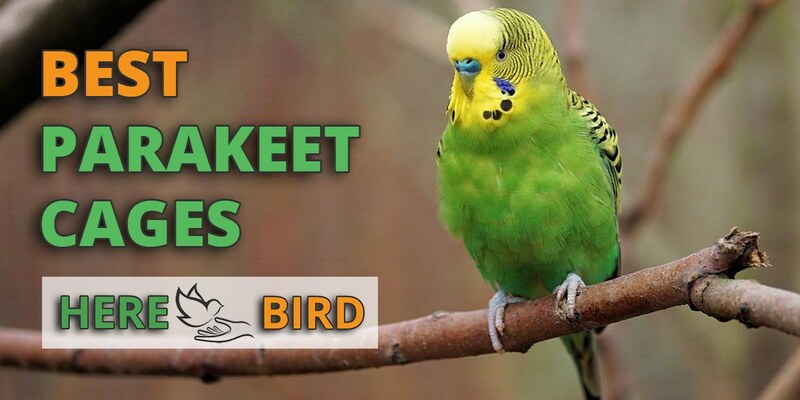 Parakeet is a name given to a group of small parrot species which includes the follow subspecies: budgerigars, rosellas, ringnecks, monks parakeets and more. This guide is for parakeet cages in general. If you own a budgerigar then you might want to check out our guide to the best budgie cages here. To choose the correct parakeet cage size, you need to think about the size of your parakeet and how many parakeets you’re going to own. This will then allow you to correctly calculate the right cage size, bar thickness and also bar spacing that your bird needs. 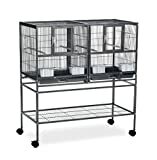 With parakeet cages, bigger is better, so if your budget allows for it – go large! So you can see there is quite a difference between these parakeets and so they’ll require different sizes. The recommended sizes below are for parakeets on the smaller end of the scale. 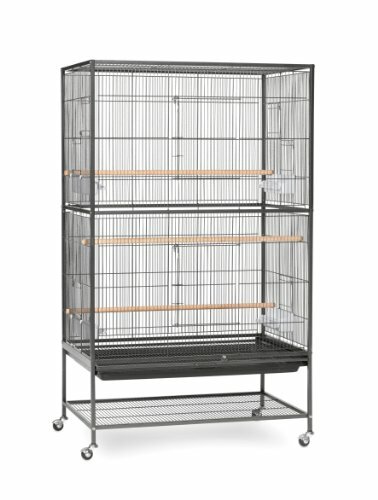 For a small parakeet, we recommend getting a cage this is sized: width 20″, depth 24″, height 24″. Some people drop this cage sizing down to 18″ x 18″ x 20″ but this really is at the minimum side of things. We also recommend you go for cages that tend to be wider rather than taller as parakeets generally prefer flying horizontally. If you go for a large parakeet cage then you’ll be able to include more accessories such as extra perches, toys and ladders that will keep your parakeet entertained. If you want a cage sized for two parakeets then the rule of thumb is to multiply the volume by 1.5 to 2 times for every extra parakeet. So let’s say a smaller sized parakeet were to have a single cage at 20 inches wide, 24 inches deep and 24 inches high. Then with two parakeets you would double the volume and have a cage sized at around 24 inches wide, 30 inches deep and 30 inches high. The gaps between the bars on your cage should not exceed 1/2″ for parakeets. It’s not just whether or not bird can fit it’s entire body through the cage. You should judge it based upon whether it’s head can fit through the gaps. Birds can get very injured if they’re able to do this and so you should try to avoid it. Perhaps the least important sizing consideration, but still something to think about. According to AnimalDiversity.org, small parakeets are frequent chewers and so you want the thickness of your parakeet wiring or bars to be no less than 2mm in size so they can’t be chewed and bent by the bird. Horizontal bars are an additional bonus as they allow for your birds to climb up the cage. A single parakeet can be kept in a small cage but if you have several then you’re going to need something larger like a flight cage. 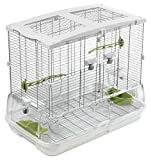 Double parakeet cages or ones that are built for two or more birds are useful for breeding your parakeets and are designed so that parakeet’s won’t just be laying their eggs on the bottom of the cage. There are also the smaller travel cages that tend to be used when transporting your parakeets to and from the vets. Also the hanging parakeet cage which is great if you want to display you bird a bit better in your house (though they tend to be small in size). Finally there is the parakeet cage that comes with a stand or playtop – these are great for really spoiling your birds and keeping them entertained. Some people recommend horizontal cages over vertical ones as parakeets prefer flying sideways and not vertically. Round or circular shaped cages should be generally avoided. 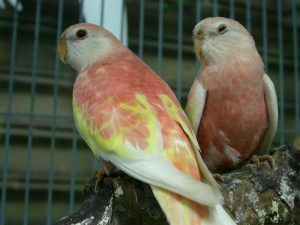 Also, larger parakeet cages tend to come with a stand whereas smaller ones do not – so an additional cage stand may be needed during purchased. A parakeet cage doesn’t need to be fully kitted out as many bird cage accessories can be bought separately – but having them already included does makes things easier. According to Hari.ca, the standard features that are usually included are perches, doors plus feeding and watering stations plus a removable cleaning tray. Additional accessories that you might sometimes get include a perches, playtop, toys, feeding guards and cup holders. These additional accessories will help with the physical and mental health of your birds. For example, toys will make them happier and different perch sizes will prevent foot problems. You might find a cage that looks beautiful but how practical is it? A good parakeet cage will have an easily cleanable floor and one that is even removable. The feeding and watering trays should be on the sides so you can easily top them up. Plus the doors should be easily accessible and big enough to accommodate your parakeet and it helps if the doors can pivot in both directions. Because most parakeet cages are small in size, they are fairly easy to set up – however, some of the bigger cages may require 2 people for construction (but these are only the super sized ones). 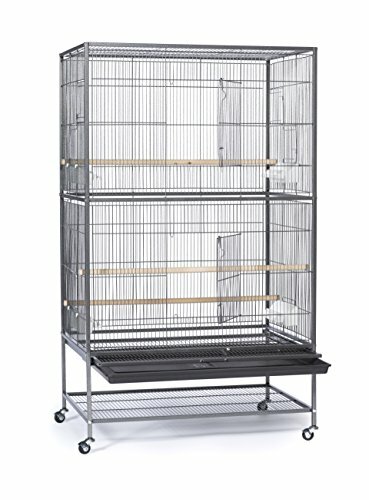 You can get a small, low end bird cage starting at around $70 if you want something cheap. However, ideally you want to be spending at least $100 for a parakeet bird cage and $200 dollars or more if you want to give you parakeet a high quality home. You can get very small, travel bird cages starting at $30 but these are as a back up solution and shouldn’t be used as a permanent home. When factoring in your budget, you’ll also want to think about the accessories that you need to purchase which we’ll talk about in the latter part of this guide. One of the largest parakeet cages available, allowing for extra room to fly and plenty of space for more toys and perches. Cage has multiple doors so it’s very easy to handle and access the inside. Multiple perches and feeding trays means your birds will already have a lot of space to begin with and then there’s even more space for you to add additional features. Extra room on the storage shelf is very useful. Some users have reported minor delivery issues when the cage has been sent to them. 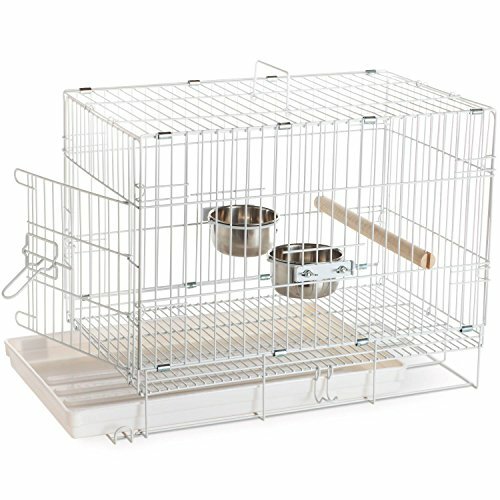 Owners that choose this bird cage will be spoiling their parakeets with the extra room they’ll be providing. This flight cage also comes in an additional “X-Large” option for even more space if you require it. Size wise, this cage is the best one in our group. The cage also comes with all of the standard and expected bird cage features (feeding trays, removable grills etc.) and there will be plenty of additional space for you to insert toys as well. There’s also lot’s of perching room for your birds with the 3 extra large perches provided. The large removable tray will make cleaning easy for you, plus the cage comes has a bottom storage area on it’s stand that will be able to keep all of your bird supplies. Made from durable wrought iron metal, the cage will last for many years. Whilst large in size, the construction is still fairly straightforward and easy. Unique collapsible design means the cage takes up minimal space when not in use. Very lightweight and easy to pick up and handle – so carrying the cage isn’t an issue. 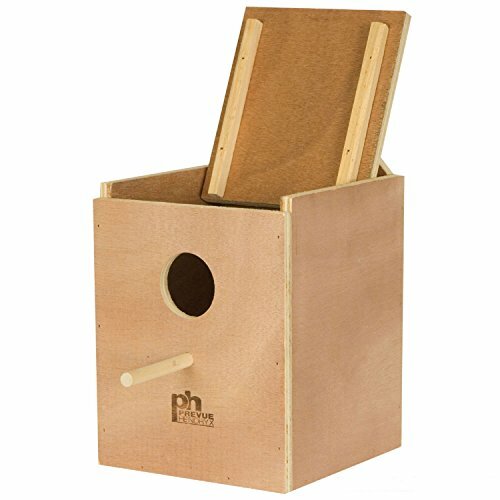 Has all of the basic internal features that a bird needs (perch, feeding/watering trays). Recommended as the backup solution for your parakeets. Shouldn’t be used as a main cage – only as a temporary backup. Keep in mind that the purpose of this cage is not to house your parakeet but instead to be used as a temporary cage if the need arises. 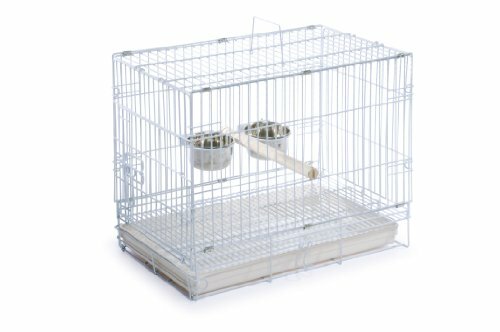 For example, you’ll use this cage in situations such as taking your bird to the vet, cleaning your main cage, when travelling with your bird or just in case of an emergency. Whilst small, the cage is very lightweight which makes this very easy for you to pick up and carry. The cage doesn’t have many internal features, but that’s ok as a temporary solution because it contains all of the main ones required such as a perches plus water/feeder trays. One unique feature of this cage is that when it’s not in use it can be collapsed and folded away, making the unused cage take up minimal storage space. We recommend purchasing this cage as an additional backup cage that can be used in case of an emergency or for use when travelling. Lightweight build quality makes it easy to handle and move this bird cage. Contains all of the features needed to get a beginner parakeet owner going, plus they’re easy to put together as well. Has enough space to house parakeets and room for toys to be placed. 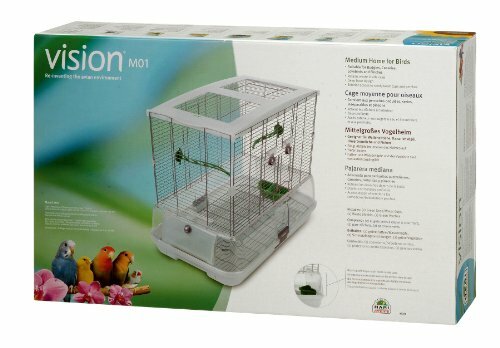 A great beginner cage for parakeets. Some parts are made from plastic which whilst being high quality and able to last a few years, won’t be as long lasting as metal. 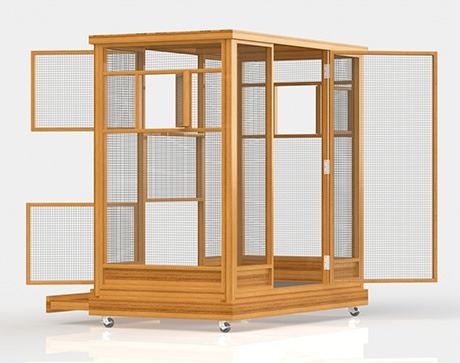 This bird cage is built with lightweight materials and has a slimline design that makes it very easy to handle and move around the house (especially when compared with the heavier metal iron cage alternatives). However, we did knock off half a point because some parts of the cage are made from plastic. Whilst this is good quality plastic that will last a long time, it’s not going to be as timeless as steel or iron based cages. The cage has all of the features internal needed to get a bird owner started (perches, watering bowls, floor grill+removable tray etc.) – so it’s a popular choice amongst many new bird owners. It’s very straightforward and easy to use/put together so you’re not going to be spending time working out how all the parts fit together. Size wise it’s not super roomy and won’t provide your bird with a lot of flight space, however, it’s not small either and so is big enough for most parakeet owners. You’ll have enough room to place some additional toys to keep your birds entertained. Can be used to house multiple birds of next to one another (but also kept separate for breeding or to prevent fighting). Modular system allows extra cages to be stacked on top of one another and linked together. Central divider is easy to remove if you choose and thus makes the cage much more roomy for your birds. Easy to move around a room with it’s wheels and comes with storage space for your bird supplies. Some users have reported the bottom trays not sliding out easily for cleaning. Isn’t a good purchase unless you have a reason for keeping your birds apart. You might think that this bird cage is only for people that want to breed parakeets but you’d be wrong. Whilst this bird cage system is great for breeding, it’s also very useful for keeping fighting birds apart and for housing birds of different species next to one another. Essentially, when you get this cage you’re getting two smaller bird cages for the price of one medium cage. However, if you choose, you can remove the central divider and therefore create one larger cage. Even better, these cages are designed to be stackable and so you can place an additional pair of the same cages on top of this one. 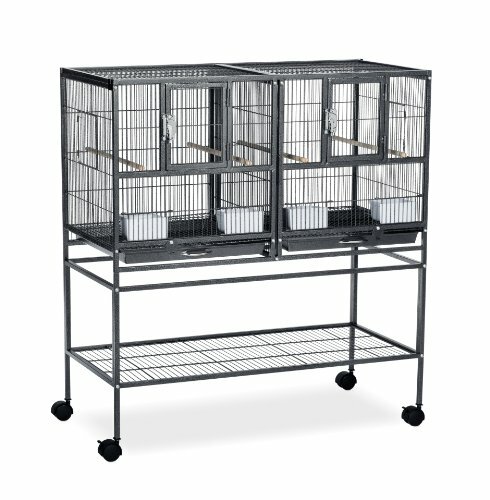 Good for bird owners that are looking for a modular system of bird cages that can be used together. In terms of the looks of this cage, it’s more beautiful than most and will look very attractive in most homes. Easy to put together with straightforward instructions. Very easy to clean the cage, also easy to access and top up the food/water trays on the cage. Handing stand for the cage must be bought separately. Doesn’t provide a lot of room for your birds, although the cage is larger than it looks in the photo. 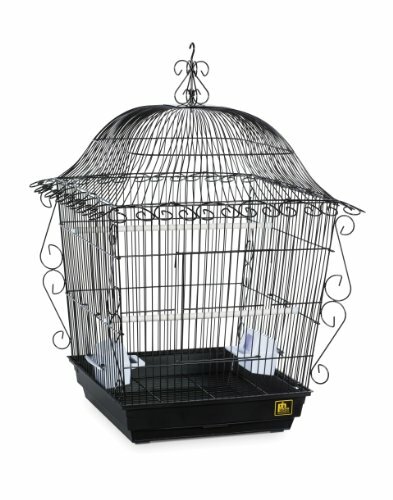 This bird cage is unique amongst our current group because it needs to be hung and so you’ll need to buy an additional bird cage hanging stand. Style wise, the cage looks much more beautiful than normal thanks to it’s fancy external metal work. This cage is pretty small in size and so should only really be used with smaller sized parakeets. It comes with 2 perches for your parakeets to fly between but you might want to add some additional toys and features to keep your birds entertained. The bottom grill and access doors work pretty well so it’s easy to handle. An additional note we’d like to add to this video is that you should keep the room temperature that your parakeet cage is in at around 20 to 26 degrees celsius or (68 to 78.8 fahrenheit). Those that are interested in building their own DIY parakeet cage might want to check out our construction guide which lays out the plans for doing so here. As part of your budget, you should also think about picking up a number of accessories which will improve the quality of life for your pet bird. Because parakeets are intelligent birds, they need objects to play with to keep their minds occupied. This is why each parakeet cage should have a few toys. 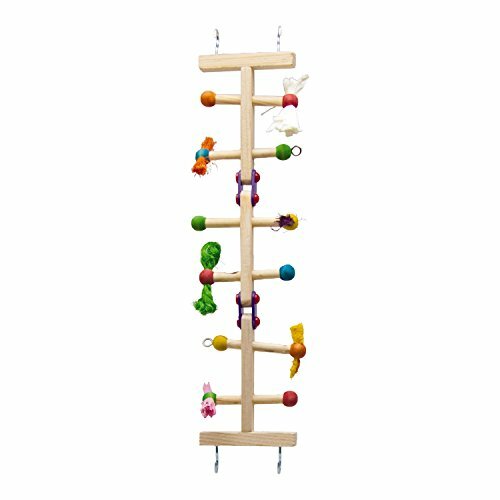 Some popular ideas for parakeet toys include play stand and pens, ladders, foraging toys and chewing or shreddable toys – all of which can be found here. Or you can make your own parakeet toy with our homemade parrot toy making guide here. Just as important as your parakeet cage is the parakeet food that you feed your birds. 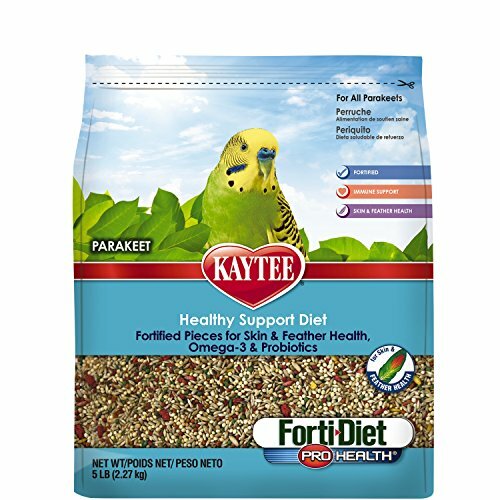 Fortunately, Kaytee are a established brand that provide parakeet food in a specialized bird feed formula that is rich is Omega 3’s – you can find this here. Instead of just bird seed, there are other foods available such as parakeet pellets and also parakeet treats like cuttlebone snacks. Wanting to nest is part of the natural urge of your bird. However, a caged bird is unable to forage for sticks and twigs to build it’s nest. A parakeet nesting box is a nice remedy to this solution which once installed will provide your birds with a nice protective shelter for them to nest in. An example of one such home can be found here. While it might initially seem like a good idea to buy a used parakeet cage, we advise against it for a number of reasons. You often don’t know what material the cage is made from and this could potentially be toxic and harmful for your parakeet. If you do find a cheap parakeet cage, you’ll also need to check for defects, cracks and any wires sticking out. This will require repairs and you’ll have no ability to return the item if you discover further damage. If you really are going down this route, you can find parakeet cages for sale that are second hand on places such as Ebay, Craigslist or Gumtree. 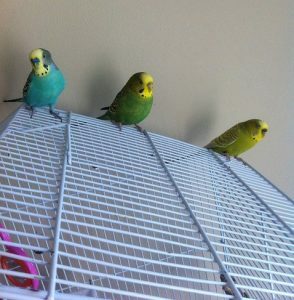 What type of parakeet do you own? With this guide hopefully you’ll now be able to choose the right type of cage (classic, flight cages or hanging etc. ), which is of the correct size (large, small or double), is made out of the right materials (stainless steel), is easy to use and finally is within your budget. Let us know if the comments below if there is anything to add or any personal stories you’d like to share. With your parakeet cage chosen, the next thing you may want to think about is training your parakeet which you can do using our guide here. You may also want to check out our guide to parakeet food.